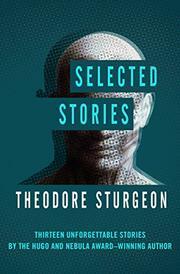 A dozen stories from Sturgeon (1918–85; Godbody, 1986, etc), who published nearly all of his famous stories in a 20-year period from the mid-1940s—and who thereafter was silent. His themes were transcendence, sexual and social diversity and tolerance, and spiritual rebirth; his typical protagonists were tormented and alienated until they found healing peace and joy through contact with higher beings. Such themes arouse little antagonism today, but at the time many editors would not publish fiction dealing frankly with sexuality, love, or passion. “Thunder and Roses” boldly confronts the aftermath of a nuclear attack. “The Golden Helix” features aliens and, yes, transcendence. “Killdozer” was the original homicidal vehicle. In “The [Widget], the [Wadget], and Boff,” benevolent aliens test humanity for the reflex that marks the truly transcendental being. “The Man Who Lost the Sea” is an astronaut dying on Mars. And in “Slow Sculpture,” a woman dying of cancer meets a remarkable alien doctor. No longer controversial, perhaps, but richly crafted and timelessly affecting.